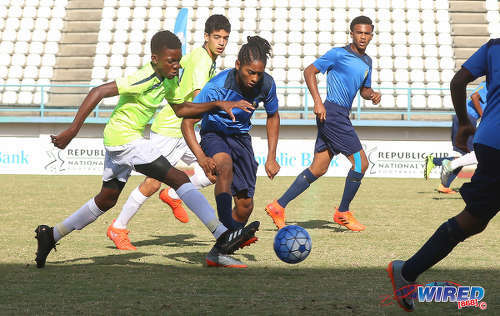 Queen’s Park Cricket Club (QPCC) and FC Santa Rosa threw down the gauntlet for the 2018 Republic Bank National Youth League (RBNYL) season at the Larry Gomes Stadium in Malabar yesterday. The two clubs notched victories over a Southern Football Association (SFA) XI (Under-12s) and a Northern Football Association (NFA) XI (Under-16s) respectively. 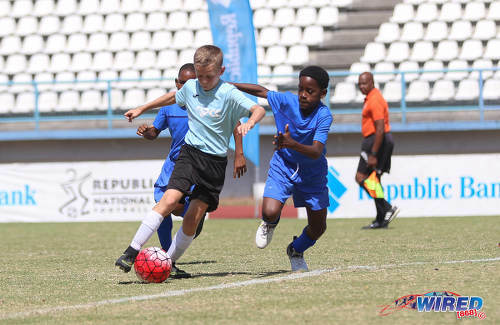 Last year, QPCC, Central FC and Rosa were the RBNYL champions in the Under-11, Under-13 and Under-15 divisions respectively and organisers deemed it fitting for the winners to get the ball rolling in this the 23rd consecutive season of the youth tournament. Photo: QPCC midfielder Logan Maingot (left) drives forward with the ball while a South Zone XI player tries to stay close during RBNYL U-12 action at the Larry Gomes Stadium in Malabar on 18 March, 2018. In the day’s opener, QPCC, captained by Logan Maingot and coached by Anthony Selby, treated themselves to a handsome 3-0 win against the SFA XI. Santa Rosa got a second half item from star striker Jashawn Thomas to turn back a wasteful NFA XI in the afternoon’s second match. However, the encounter ended on a sour note for Santa Rosa as their industrious winger, Renaldo Padarath, suffered a fractured wrist in the dying moments of the game when he tried to effect a slide tackle in his penalty area. 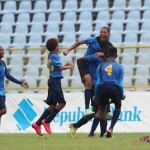 Youth Pro League (YPL) commitments prevented Central, who clinched a stunning 4-3 comeback victory against Rosa in the Under-13 division last year, from taking part in today’s proceedings. And it’s part of a wider issue which the RBNYL hopes to remedy once and for all this season. 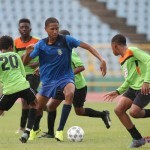 Simultaneous scheduling has led to conflict between the RBNYL and Trendsetter Hawks’ Under-15 unit forfeited a quarterfinal game to Santa Rosa at the stage after it was discovered that two of their players were still registered with San Juan Jabloteh’s YPL outfit while the RBNYL was in full swing. The successful protest by the “Big Cannons” put an end to Hawks’ unbeaten season in the Under-15 category last season. This season, however, All Sport Promotions director Anthony Harford promised, there will be no such occurrences. “For a long time we felt as though we were the little brother to the Pro League but we don’t feel that we need to be the little brother anymore as we have the bigger tournament,” Harford told Wired868. “We have over 90 teams and they are independently registered so no player in the Republic Youth Cup can play in both [tournaments]. Photo: Central FC midfielder Abdul-Quddoos Hypolite (left) strokes the ball past FC Santa Rosa goalkeeper Joshua Charlerie during the RBNYL Under-13 final at the Hasely Crawford Stadium on 1 July, 2017. The “Central” club is actually the T&T Maestros from Laventille who play under the name Central FC in the YPL competition. 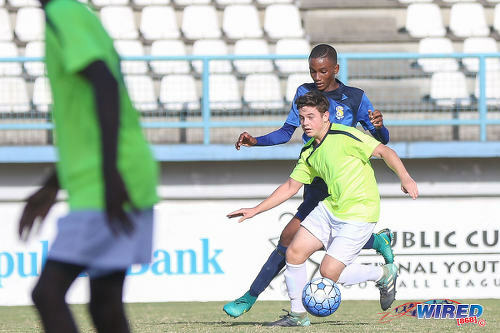 The Hawks duo, Antonio Chee Ting and Josiah Edwards, both National Youth Team players, did not actually represent Jabloteh in last year’s YPL once the RBNYL season was under way. However, the transfer forms certifying their move from Jabloteh to Hawks never reached the Pro League offices, which meant that the two youngsters were still officially registered with the “San Juan Kings” while strutting their stuff with the Anthony “Dada” Wickham-coached Hawks team. 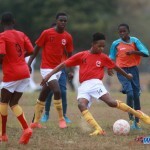 Harford assured Wired868 that there will be no problem either with clubs like Central and Jabloteh who usually turn out teams in both youth tournaments. Central’s victorious team from last season, Harford noted, has now been split up between the club’s YPL Under-14 and Under-16 outfits. 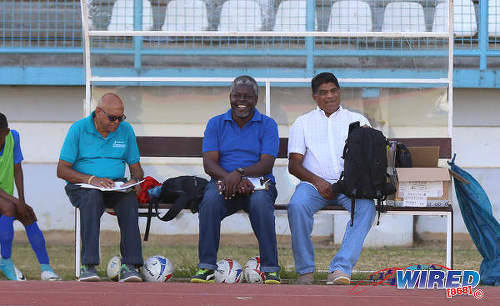 Photo: All Sports Promotion director Anthony Harford (right) and administrators Camal Basdeo (left) and Gerald Elliot enjoy RBNYL action at the Larry Gomes Stadium on 18 March, 2018. Harford also reckons that the RBNYL is a good platform for youngsters to get exposure and develop their talents. And he pointed to a number of players who have gone on to represent the country at the national youth level. One player likely to do that is Abdul-Quddoos Hypolite. The talented youngster, who first caught Wired868’s attention as a tricky, energetic customer with Trendsetter Hawks a few years ago, walked away with MVP honours last season after rallying the Sharks to a come-from-behind victory against Santa Rosa. 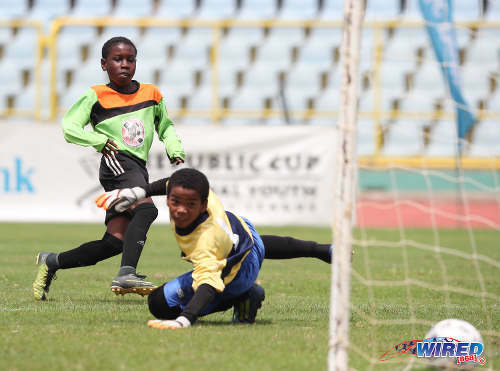 Photo: South Zone XI goalkeeper Aaron Babwah (centre) keeps his eyes on the ball during RBNYL U-12 action at the Larry Gomes Stadium in Malabar on 18 March, 2018. The NFA XI, overseen by Marlon Phillip and Jason Sheppard, eventually succumbed to a close-range Thomas strike in the 51st minute of an 80-minute match. And although Harford would have been heartened by the display of Kaihim Thomas, whose mazy runs were problematic for defenders all game long, he would have been less pleased with the team’s finishing. After all, the Northern youngsters are due to go off to Canada on a 13-day tour in August. In preparation for the at least five games they play on that tour, despite returning to their respective clubs after yesterday, the NFA players will contest exhibition games at least once a month between now and August. Harford, who’s also the North Zone president, explained that the City of Port-of-Spain and the City of St Catherine’s in Canada are twinned and this year is the 50th anniversary of the twining. So they put together the same group of Under-15 boys who had played unbeaten to win last season’s Interzone title and the fund-raising efforts began immediately. Photo: North Zone XI midfielder Lucas Farfan (foreground) looks for a passing option while FC Santa Rosa player Isaiah Richardson stays close during RBNYL U-16 action at the Larry Gomes Stadium in Malabar on 18 March 2018. But the Canada tour should not have been on the minds of the NFA players as they tried to get bragging rights over their Santa Rosa counterparts. Santa Rosa’s emphasis, club founder Keith Look Loy stresses, is solidity in defence and Rosa player Hayden Sealey stuck to NFA’s Mamade Guerra like white on rice for most of the contest. But the NFA team did not capitalise on the chances they were allowed, with Guerra too among the guilty. He stabbed wide of the mark from a tight angle in the 24th minute and then shot straight at the Rosa custodian in the 33rd minute after being played through on goal. Thomas (K), who had brought his dancing shoes to the Stadium, shot tamely at the goalkeeper in two one-on-one sequences in either half of play. Santa Rosa’s lanky Thomas—who received heaps of praise from his Under-13 coach Justin De Freitas during last season’s RBNYL—beat his chest in jubilation, storming off to celebrate in front of the Rosa fans after his winner. The enthusiastic Padarath too impressed, displaying electric pace down the right flank and putting in a workmanlike shift on both sides of the ball as well. However, he left the arena with a fractured wrist and his arm in a sling after making a valiant sliding tackle to try and stop a marauding NFA run. His arm, he was told, must remain in a cast for two months. Photo: FC Santa Rosa midfielder Renaldo Padarath (centre) challenges the ball against a North Zone XI player during RBNYL U-16 action at the Larry Gomes Stadium in Malabar on 18 March 2018. If Padarath was the outstanding player in the Under-16 encounter, the QPCC vs SFA match-up produced no single outstanding player. QPCC were always in control and showed their prowess from set pieces, skipper Maingot opening the scoring with a towering first half header while Stephen Griffith and Caden Trestrail, two of the three coming from right-side corner kicks. Just before the end, Kade Collier also had a free kick item whistled off. SFA’s Ari John and Jeremiah Niles also showed good individual ability, the latter forcing QPCC keeper Michael-Peter Hadad into two fine saves in the 50th minute. 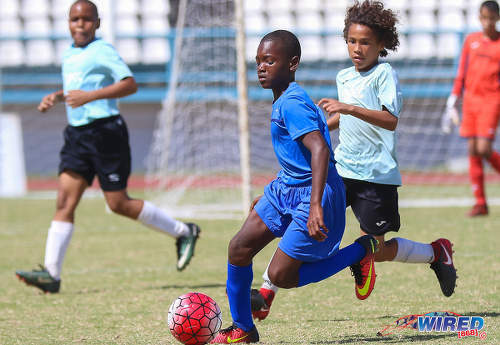 Following their dramatic penalty shootout win over Jabloteh in the Under-11 division last year, the QPCC lads went on to the Disney Cup where they faced some stiff overseas competition. Selby said he’s looking forward to see them apply all they have learnt over the past 12 months. Photo: A South Zone XI player (left) tries to outpace QPCC attacker Luke Correia during RBNYL U-12 action at the Larry Gomes Stadium in Malabar on 18 March, 2018. Selby would love to see his charges continue that kind of display and build on the solid foundation they set last season. Competitive action in the 2018 RBNYL season will get under way from 24 March, the North Zone getting the show on the road. The action breaks again, however, during the Easter holiday weekend. 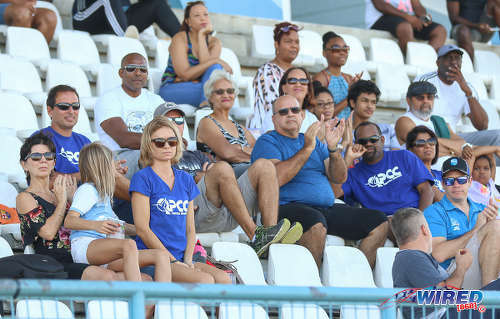 Photo: QPCC supporters get behind their team during RBNYL U-12 action at the Larry Gomes Stadium in Malabar on 18 March, 2018. Editor’s Note: Wired868 complained to several QPCC youth team staff members and All Sports Promotions last season about the absence of numbers on QPCC jerseys, which forces our reporters to jot down the physical characteristics or colour boots of each player with the hope of getting their names after the match. Wires868 wishes to repeat the complaint publicly here. Wired868 will not cover any more QPCC Youth Team matches in 2018 until their players wear clearly visible numbers, which match the information on the team sheets. We apologise in advance for any inconvenience caused to readers. ..Leave Rosa outta dat please. We name does call enuff. LOL..
Maybe FC Santa Rosa, Trendsetter Hawks and others should get together and throw a barbecue to raise funds so that QPCC can afford to put numbers on their uniforms. At roughly TT$600 per team for numbers on pants and shirts, you are talking about TT$30 per player. Spread that over five months and it is TT$6 per player. Bruce Aanensen, is it that QPCC parents don’t have TT$6 per month left to spend on their children? Or they just don’t care about rules? It is frustrating and I don’t get how they are not embarrassed by this. Like I said, I raised it with two QPCC coaches and a manager last season and complained to All Sports. And they could get those prints done within a day if they wanted to. It’s a recurring nightmare Lasana Liburd. Year after year. We will put our foot down this season. Agreed Lasana Liburd. Enough about it is youth football. Rules are rules. Lasana Liburd . Once it is a part of the playing regulations, it should be enforced. Hope there is no conflict. I have a feeling it was not in the initial rules, since I helped draft those years ago with Mr. Piper. However…seeing the complaints last year, the amendment should have been made. Can’t play by FIFA rules and not have numbers Nicholas Lochan. May have been an oversight? Caledonia aren’t in the Youth Pro League this season… Or is it that they are just skipping the U-18 competition? No under 18 this year ….I am doing the league commentry.. Imagine I worked hard to create this team called “Maestros”… And then we play under a different name. So Maestros don’t lift a trophy, don’t get name recognition in the media… And probably concede their rights to receive training compensation too if one of their hot talents ever turns pro. 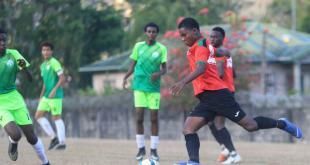 Instead, Central FC can claim for his training last year and Morvant Caledonia can claim for his money this year. Good luck to them yes. That makes zero sense to me. pro league clubs have been doing that since the beginning of time. They collect fees in the name of development but it never reaches the youth or teams that they “adopt”, therefore it should be renamed adoption fee. Adopt a school, adopt coaching school or just simply adpt a community team. FIFA isn’t going to change its rules for the benefit of Trinidad and Tobago though. The reality is the clubs who play under a different name have no legal leg to stand on when they agree to play under the name of another team. It falls on the Pro League club’s discretion. So the various community clubs have to consider what they want for themselves. That’s correct Maestro represents Caledonia. ..
Lasana Liburd my biggest issue with that, if having youth teams is a requirement for participation in the pro-league, then have youth teams, stop outsourcing. Unfortunately its just a check in the box. Nwadike it’s a sham. And I’m suspicious as to why they have held on to the pretence despite the financial problems. But if there are teams happy to spend all their hard earned money on giving Pro League clubs their players free of charge without so much as a uniform in return. Well what can I say. Go brave. Years from now when a Pro League club is collecting US$150,000 for a player that the community club developed, maybe they might be lucky and get four or five footballs in return. Giovanne yes. The training compensation scenario only applies to clubs who play in official competition btw. So youth teams who play in “minor league” competitions alone have nothing to get. In Levi’s case, he signed for Central FC and never played. Also he was a minor at the time and neither of his parents signed that form for him. Central might not have won if the case went to FIFA but it might have denied Levi an opportunity to move to Holland so they made them a payment anyway. That’s about right Dion Sosa?